Sibling rivalry in the garden isn't what it used to be. For example, for sweet corn, I always just assumed that my youngest sister and I were competing to grow the sweetest, earliest sweet corn of the summer. But my corn has just been okay this year, and I think it is a bit behind. So when I went over to my sister's garden, ready to admit defeat, I was shocked to find out that this year, she didn't even plant sweet corn. I checked with my older sister to find out how her sweet corn was doing and found out she didn't plant any either. I win the sweet corn growing competition. 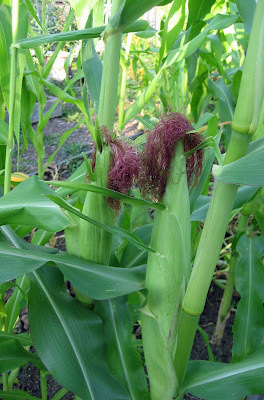 When I harvest those two ears shown above, in a few days, it will be the sweetest sweet corn in the family. It will also be the only sweet corn in the family. Let's move on to tomatoes. My sister had these tomatoes all lined up on the window sill. "Hey, Sis, some of those 'maters look awfully green to be a-picken them, what's going on?" Turns out that her husband knocked them off while he was weeding. Now how does that happen? Well, they caged their tomatoes and some of the tomato plants were sprawling all over the ground, so when he moved the vines to weed around them, I guess some of the green tomatoes fell off. Oh, and the tomatoes were suffering from sun scald. Based on this mis-treatment of tomatoes I've disqualified them from the tomato growing competition. But I didn't do it just because of the cages, though I ought to, I actually disqualified them for buying their tomato plants in the spring and not starting them from seed. Those are the rules. I don't just make them up, I follow them, too. We can't have people just doing as they please and expect to win. Tomato plants must be started from seed and staked! I'm not even going to mention, by the way, that she doesn't remember which varieties of tomatoes she has. But I will say she had a lot of cherry tomatoes, and they were good. My older sister also bought her tomato plants, so even if she doesn't have a ripe tomato yet, anyway, she's still disqualified. I win again when it comes to the tomatoes. Which brings us to green beans. This competition is really just about having some to harvest, or not. My oldest sister does not have any beans to harvest because the bunnies ate her plants. And it wasn't my fault! My youngest sister has green beans and has harvested some, but I had to disqualify her because I personally had to point out that she had green beans to harvest before she picked any. Apparently she hadn't been out to the garden for a few days. I win the green bean growing competition. I win all three competitions! Would anyone like to join our friendly competition? Fun story to read. Congratulations on your 3/3 victory. Gives new meaning to the phrase "victory garden" -- is there a trophy or a trowel with year and named engraved that you hand back and forth to the annual winner? Lemme see?? What can I enter that will knowingly beat you. How about a Teddy Bear Sunflower? If you don't have one--I win. Great story cause I like how you forced the rules and disqualified the competition. That's the spirit. I bet yours would have won anyway. "Those are the rules. I don't just make them up, I follow them, too. " I knew we were kindred spirits. I was going to say I'm disqualified because I don't grow any veggies. But then I remembered The Artichoke! Hot damn, I win the best artichoke competition! There's nothing wrong with a little friendly competition - emphasis on the word "friendly." No one suspects you of turning rabbits loose in your sister's garden. Really, we don't. To even have some friendly sibling garden rivalry, you need to have gardening siblings, and they need to have similar growing conditions. I lose on both counts. Well, I can't count my sister up north, cause she has the moderating influence of Lake Ontario. And my brother in the Hudson River Valley is warmer and wetter. I think. Anyway, if I'm in competition with you--I give up already! I bought my tomato plants at a local garden center, I put cages around them, and I picked green beans when I noticed there were all these long green things hanging off the plant. The trophy is all yours, Carol! I visited your garden yesterday, and I am the winner of the weed free category. Also, I think I win in the "my squash is still thriving" category. But your garden does look nice. Congratulations! It's nice that your sisters like gardening too. I'm the only son of my family that grow plants. Goodluck..
At least your sisters garden. Seems to me you all win! Of course, you're the most winning of all, but you do all win. Hey, I protest! It's been a busy summer!